Gilman’s Kitchen and Bath is a fully licensed contractor based in San Francisco, California. As our customer, you will work with our Design-Build team that includes coordinators, assistants, a project manager, and several skilled craftsmen and laborers. This gives you the benefit of working with a single company for a kitchen remodel in San Francisco, rather than having to hire several different contractors. Even if you have already hired an independent contractor or designer for your kitchen cabinet remodeling needs, we invite you to visit one of our showrooms to get additional ideas for your projects. You can find our showrooms in Mountain View, San Francisco, San Mateo, or San Rafael. 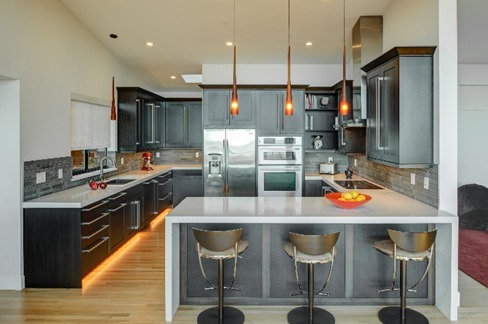 Budget: The average price might seem quite high, but keep in mind that costs of materials typically make up at least two-thirds of the cost of a kitchen remodel. You can reduce your price significantly by choosing your materials carefully. It’s also a good idea to add 10 percent to your kitchen remodel budget for unexpected costs that could arise during the project. Labor: Cost of labor is a significant factor in any remodelling project. A kitchen remodel contractor who has been on the job only a few months will obviously charge less than a more experienced contractor, but you could end up with less than desirable quality. Gilmans Kitchens and Baths has provided nearly 30 years of service to homeowners in the San Francisco community and beyond. We always provide transparent labor costs to help you prepare your budget. Longevity: It’s important to consider how long you plan to live in your home when deciding how much you want to spend on remodeling the kitchen. We recommend spending 15 percent or less of the value of your home on the project if you plan to move in the next ten years. Another thing to consider is that the kitchen is one of the most important areas of the home for prospective buyers and an upgrade can help you receive a higher selling price when you decide to put your house on the market. Kitchen size: Since we price the cost of materials by the square foot, the current size of your kitchen plays a big part in the total cost to remodel it. This is also something to consider if you plan to enlarge the size of your kitchen. Materials: As mentioned above, your kitchen remodel costs depend largely on your choice of materials since they make up slightly more than two-thirds of the budget. We offer you a wide range of kitchen cabinet choices with materials to ensure that you select what is most appropriate for your budget and your aesthetic goals. Miscellaneous costs (i.e. permits): We encourage you to check with your city government to find out if you will need a permit before starting the remodeling work or if you need to meet any other requirements. If so, these figure into the total cost of your kitchen remodel project. Neighborhood: If you plan to sell your home at some point, try to find out if your neighbors have undergone a kitchen remodel and the approximate amount they spent on it. When it comes time to put your house on the market, buyers may shy away from making an offer on your home if it has a large kitchen that significantly adds to the price. 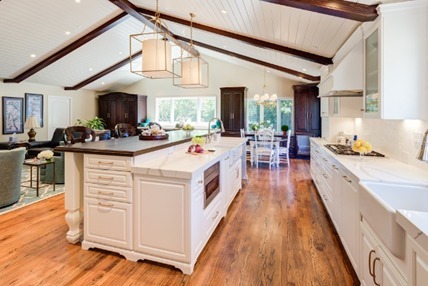 Trends: When designing your kitchen remodel plan, consider current hot trends as well as how attractive the design may be several years from now. The last thing you want to do is undertake a second kitchen remodel because your first one became outdated too quickly. Some of the most popular kitchen design trends right now include concrete counters and sleek appliances. Many people who start this process wonder how much value a kitchen remodel adds to their home. 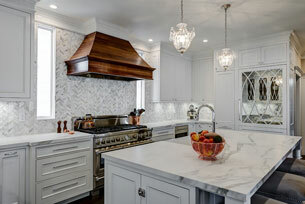 We are happy to tell you that a kitchen remodel can significantly increase your San Francisco home value. According to the online publication SFGate,it can be as high as 85%. SFGate states that the greatest values for buyers include updating old appliances to more energy-efficient models as well as updating the appearance of tile floors and kitchen cabinets. Your home will also be more valuable to you, even if you don’t plan to move any time soon. Not only will you enjoy the kitchen more, but you will save money by installing appliances that require less energy to operate. During this first stage of your San Francisco kitchen remodel design, we identify the goals of the project and help you create a budget that remains consistent with your needs and lifestyle. Our crew spends considerable time evaluating the current condition of your kitchen and determining the best plan for starting our work. If we spot any potential issues that could challenge the design plan, we will point them out and seek your input for a solution. We are now ready to create a detailed project scope and an outline for your budget, which we will present to you and obtain your approval before officially getting the project underway. As we move onto the design phase, our team creates a schematic design and shares the new floor plans with you for approval. We also discuss kitchen cabinet design and kitchen cabinet installation at this point. Continuing in the design development phase, we also document various design elements that include fixture selections and finishes that you have indicated you want to include in your kitchen remodel. We then draft construction documents that include technical specifications. During this time, you will work with a design coordinator who will be in continuous communication with you to seek your input. For the final phase of your kitchen remodel, we start prepping the site and preparing your kitchen to undergo construction. You can expect the build phase to be the longest part of your project. It includes everything from the building and constructing of your new kitchen to arranging for inspection and receiving final approval from the city. The last step is wrap-up and decommission. This is when we complete a final walk-through of your new kitchen, remove our construction materials, and clean up any remaining disruption to your living space. You’re now free to enjoy your new kitchen! We invite you to visit the showroom closest to you to learn more about our kitchen remodeling services and see examples of the products we carry.